There are a number of websites devoted to Chicago radio stations but as far as I know none with any large number of surveys. We're doing something about that. All regular weekly WLS surveys are posted through December, 1982! WCFL surveys now up, all 1966, 67, 68, and 1969 into October. All 1970, 71, 72, 73, 74 and 1975 up to December 20th! Over 200 WJJD surveys from the 1950's through 1960 now up! Eventually other area surveys from the 1950's through 1980's will be posted. Click left survey logo to view WLS surveys. or right one for WCFL. Link just below for WJJD. All information is as published then. ALL CHICAGOLAND SURVEYS THAT DISSAPPEARED FROM THIS SITE ARE NOW BACK UP! Now posting WJJD surveys. Starting with the first one issued in June, 1956 except 6/18, plus the rest of 1956, all 1957, 1958, 1959 and 1960 now up! Click here to see 'em! Due to being away for a long time for business, it's been a while since I've posted "new" surveys. I'm back and am working to get more up even if at times they have to be done a few at a time. Below, some of the WLS jocks from the mid sixties. Sadly we note that Art Roberts passed away Wed. March 6, 2002. Also that Jerry Kaye (WLS "East Of Midnight" DJ) (not pictured) passed away September 25, 2005. 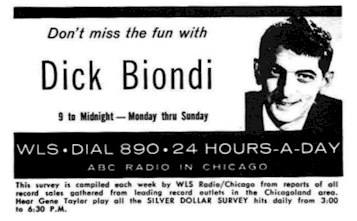 These links below are to other websites devoted to Chicago radio rom the 1950's through 80's. Check out The Reel Top 40 Radio Repository to hear many of your favorite on-air personalities of the 1950's, 60's and on. Since 1996, The Original Radio Aircheck Site, not-for-profit, all contributors welcome. "Uncle Ricky" currently has over 1100 audio exhibits with descriptive text and comments. Also source for the direct links to Twin Cities jocks airchecks on that site. This is a bona fide non-profit site and needs your help to stay in existence. Don't let this great aircheck and radio history site be lost forever. Listen to radio like it was. Tom Konnard's Aircheck Factory, Aircheck Acres, Wild Rose, WI. 54984 has loads of unscoped radio from the 50's, 60's on to more recent times. Chicago and all over the country. Snail mail him for info. Chicagoland WNND-FM (lite rock station streams on the net) midday personality Scott Childers has a great site with much WLS history on it plus lists of WLS surveys he has for trade. Click on links or banner. For more on the man himself and netcast, click on his name. Today WLS is "Chicago's News Talk 89". The music and jocks may be gone but you can check out what's doing at this legend by clicking on the banner. Yep! you can listen to a live stream if you happen to be out of the signal's range which with many former daytimers now on 24/7 can mean rough getting over the air further away even at night despite 50,000 watts. Many thanks to Rick Rumick, Doug Scherer, Malcolm A. MacQuillan, David Dana-Bashian, Aaron Mintz, Mike Gallant, Louis Iacueo, Rusty Evans, Stan Hendricks, Scott Childers and Bill Hengels for their great help with this project. 1980 and 1981 surveys courtesy of Doug Scherer and Scott Childers. A big thanks to the newest member of the crew, Malcolm A. MacQuillan for filling in many gaps with WJJD surveys and Randy Anderson, who has filled in holes with WCFL surveys and has provided the missing weeks of 1968 and 69 when you could only view the survey in the store and not take a copy home. Those are up. Also thanks to Randy for 1974 and 1975 WCFL surveys, plus missing 1970 ones, which are now up through December 20, 1975. Many more Chicago area surveys are needed from the 1950's through 80's. If you have any, photocopies okay if you don't want to part with originals, email the Oldiesloon at link on bottom of page. Copy then paste on the "To" line and send.